This month, I was a little “meh” about the theme for Iron Cupcake. I don’t really drink soda (I’m a tea and water kind of girl), and considered sitting this one out. But, it wouldn’t be a challenge if I didn’t do it, and besides, I was able to make something for the coffee challenge, and I drink coffee even less frequently than I drink soda. One of the few sodas I do enjoy is ginger beer. Why ginger beer instead of ginger ale? Spiciness! I love the kick of a good ginger beer, and heck, I just really like ginger. I knew I was going to need more than a little stale powdered ginger to give these cupcakes the bite I wanted, so I chopped up a bunch of the homemade candied ginger I pretty much always have on hand. That wasn’t going to be enough for me, though, so I added some ground white peppercorns and a pinch of cayenne. To make things EXTRA gingery, I used all ginger sugar: I reserved the sugar I had rolled the last batch of candied ginger in and ground out all the big clumps. Jamaica is known for its ginger beer, and I decided to go with that and cut the spiciness with a smooth buttercream full of sour lime flavor. I also used brown sugar in the frosting to give a hint of molasses flavor. I got a little creative with some of the frosting. Star tips always make me want to be creative! Another thing about these cupcakes – they’re bite-sized. And the correct way to eat them is all at once. At first, you’ll taste the lime and butter as the frosting melts in your mouth, then soft, sweet cake with chewy little bits of ginger throughout. Finally, you’ll feel the heat in the back of your throat from the pepper and ginger. They’re Bites because they’re bite-sized and they bite back! Although, if I made them again, I’d probably replace some (or all) of the milk with some nice dark rum. First, make some candied ginger. Reserve the syrup and sugar. Pour syrup into jars, seal and refrigerate for later use. Allow the sugar to dry, grind any large lumps with food processor or mortar & pestle. Sift together the flour, baking powder and salt. Grate the fresh ginger and squeeze by handfuls into a clean bowl. You should get about 2 Tbsp; combine with milk in a liquid measure. Cream the butter and sugar in a stand mixer. Add the dry and wet mixtures into the creamed mixture alternately, by thirds. Stop the mixer and scrape it down (or not if you have one of those sweet scraper paddles). Turn the mixer on medium-high and add the egg whites. Beat until fluffy (5-10 seconds). Add spices all at once and quickly incorporate (5 seconds). Preheat the oven to 350. Carefully pour the batter into lined miniature muffin tins. Bake 10-12 minutes, until a toothpick inserted in the middle of one comes out clean, but not until the cupcakes are browned at all. Allow to cool completely before frosting. I generally let cupcakes rest overnight to allow the flavors to develop. Place the egg whites, cream of tartar and brown sugar into the bowl of a stand mixer and place over a saucepan of simmering water, whisking constantly for about 5 minutes, or until light and frothy. Immediately transfer to mixer and bead on high 2-3 minutes, until you have a stiff, glossy meringue. Switch to a paddle attachment and beat on medium-high. Add the butter one piece at a time, waiting for each to be fully incorporated before adding the next. If it gets curdled or isn’t fluffy and awesome, just let it mix for a while; eventually it’ll fix itself. Once the butter is all incorporated, mix in the lime and ginger. Place in a piping bag by thirds. 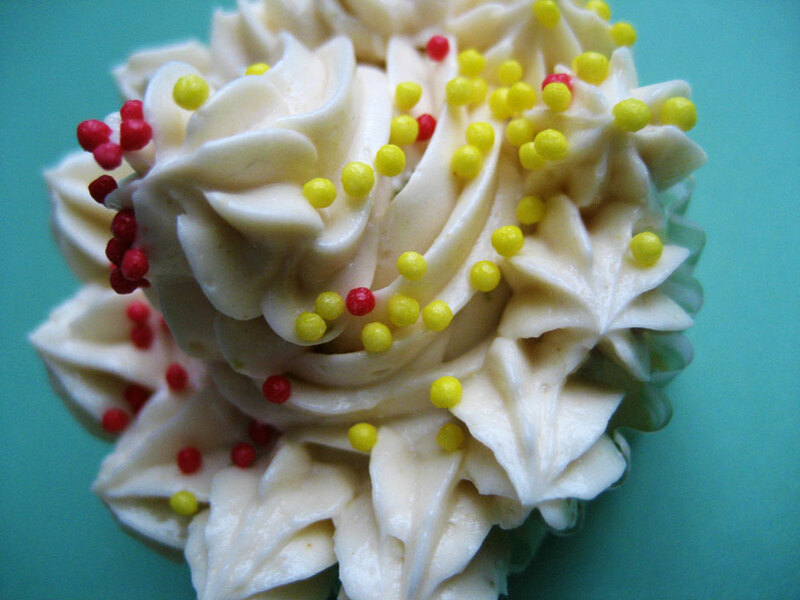 Using a fun star tip, pipe the buttercream onto the cupcakes. Decorate with sprinkles and keep refrigerated. Ginger! Sounds great! 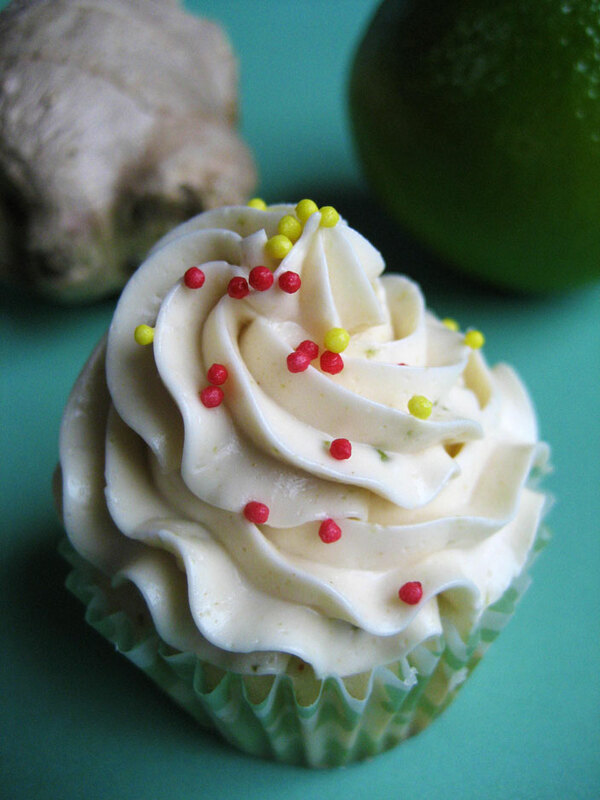 Never had ginger in cupcakes…great opportunity to try it! 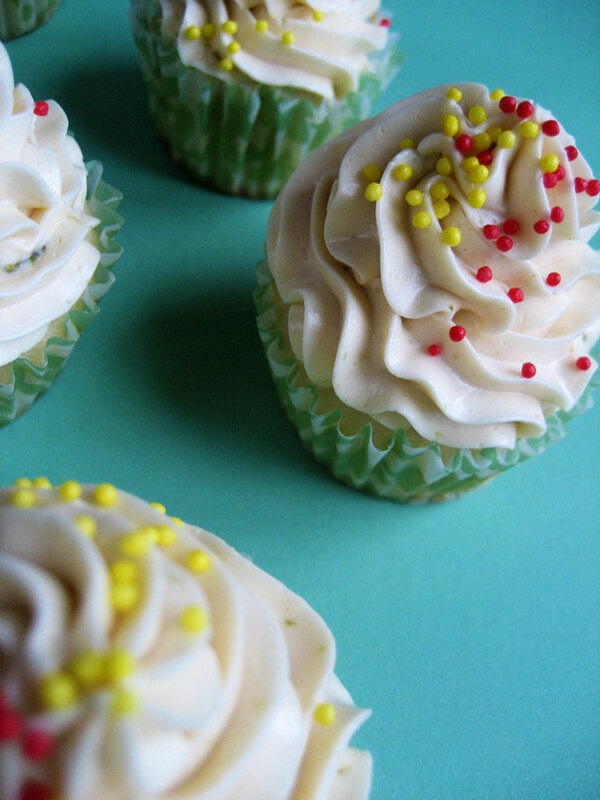 Hi, first time here and I found your cup cakes are simply attractive! Nice pics! Ginger beer is one of my favorite things, and all those other flavors (lime, white pepper, brown sugar) are spot on pairings. Clove could have been nice too. Anyway, these look and sound great!